You are suffering from Darius Kasparaitus Syndrome. Take this medicine, call your parents, leave camp early and get yourself back to Hartford for rest. Sometimes hockey players do not know when to quit. A puck in the head would be an easy way out. Such is the sad case of one of my favorite defensive veterans, Darius Kasparaitus, who in the off-season has given himself a makeover by losing 20 lbs, recovered from an unexpected trip from the NY Rangers starting lineup to the Hartford Wolfpack minor farm team, a divorce, a psychological breakdown and a heart-to-heart with NYR general manager, Glen Sather reminiscing about how the early-years Eric Lindros was once very scared of getting hit by Darius. Sam Weinman, of The Rangers Report is onsite at training camp this afternoon and had this to say, "The first day for Darius Kasparaitis wasn’t exactly a triumphant one. He may have been quicker, but he also coughed up the puck several times during the scrimmage. Maybe it was first day nerves, but he can’t afford to have a second day like it." Steve Zipay from Newsday adds, "...Kasparaitis, paired with Paul Mara, is quicker, but made some poor passes." Even if Darius impresses the coaching staff and 'steps it up', there is an impossible $3 million liability looming over his head with the NY Rangers already hitting the maximum cap salary allowed. There are just too many 'up & coming' Ranger young'ens (Marc Staal, Brodie Dupont, Ryan Callahan, Dan Girardi) to consider spending that level of salary for a player looking to prove something mostly to himself. There would be nothing more exciting seeing Darius a Ranger again showing up against Florida in October - the fans would go bonkers - a house of 'wild', but don't expect it unless you're willing to drive through New Haven and head north straight to the Hartford minors. An expensive dream. Hey Darius, The Dark Ranger has been cured of "Kasparaitus Nostalgia", a nasty little hockey-fan-disease, so let me offer a simple gesture that will make it all easier. On the other hand, who am I to tell someone to stop doing what they love. I would probably play until they drug me kicking and screaming from the ice, so I can't begrudge a guy for trying to hang on. 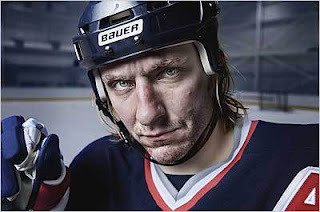 You & Jeremy Roenick both! 3) Probably Mr. Sather would prefer a team outside the East Conference. Since SJ seems intent on giving apparently washed up guys second chances, why not them? They have a slot for another defensemen we're sure.